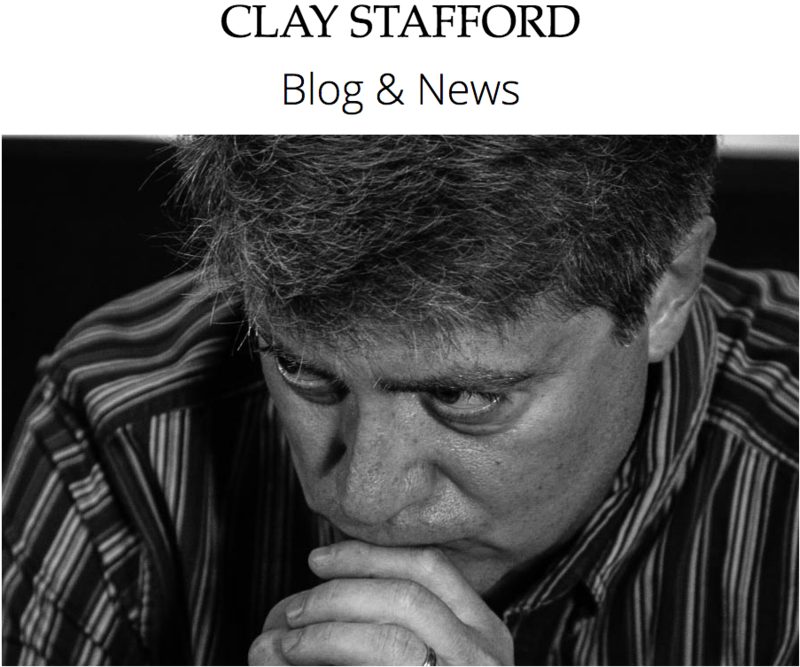 NASHVILLE – Killer Nashville founder Clay Stafford recently gifted more than 200 books to the Nashville Public Library on behalf of the Killer Nashville organization. The books will be processed for circulation at the main library, branches throughout Davidson County, and for literary programs sponsored by the public library. Many of the titles offered are from former Silver Falchion nominees and winners who participated in the Killer Nashville literary competition. “One of the goals of Killer Nashville is to encourage reading and writing, and to give back to the community,” said Clay Stafford. He arranged the library donation through Betsy Fisher, manager of reference and nonfiction materials, and Kyle Barber, manger of adult services such as the inmate reading program. Earlier this year, another nearly 300 books were donated to Battle Ground Academy in Franklin, Tennessee; Heritage Middle School in Thompson’s Station, Tennessee; and Father Ryan High School in Nashville. “We really welcome the donation,” said Betsy, explaining that the books will benefit the library throughout the system. There are 20 branches serving Davidson County residents. 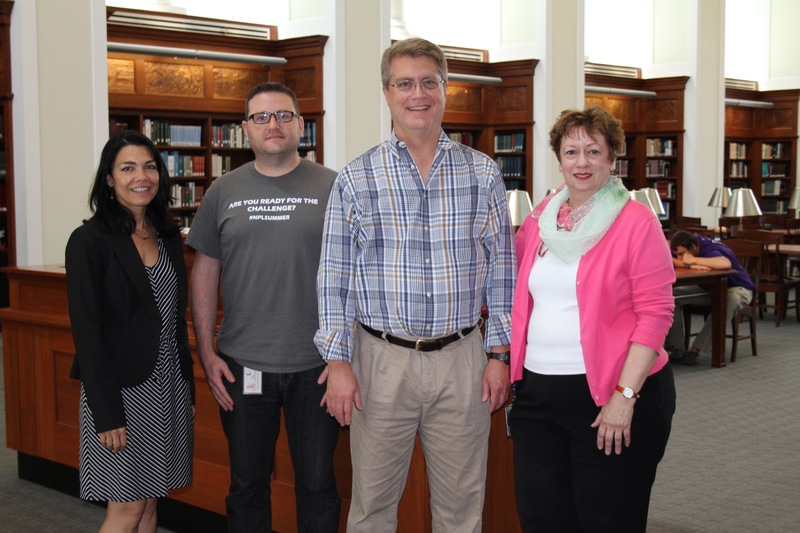 In the Nashville Public Library’s Grand Reading Room are, from left, Maria Giordano of American Blackguard Inc., Kyle Barber, the library’s manager of adult services, Clay Stafford, CEO of American Blackguard and founder of Killer Nashville, and Betsy Fisher, senior researcher. Stafford donated more than 200 books to the library Friday, June 19, 2015. Click on the photo to see it in hi-resolution. Some of the books will replace existing books that have been damaged or lost. Others will provide a print copy for titles they have in eBook form only. In some cases, they will have multiple copies of a title, and others will be new authors for them. The Nashville Public Library began circulating as the Howard Library in 1898. Over the years, it has grown through donations from the likes of Andrew Carnegie. As Nashville grew, so did its library and its branches. The new Nashville Public Library on Church Street opened in 2001. In 2014, Killer Nashville donated over 2,400 books, valued at over $48,000, to needy schools, libraries, and literacy organizations. Past activities include outreach campaigns with libraries and literacy organizations, programs involving the international fostering and support of children, and the building of libraries in Africa. Killer Nashville is a division of American Blackguard, Inc., and is a volunteer-supported charitable literary organization that connects authors with professional information, other writers, new readers, and industry professionals through an annual conference and other supporting publications and events. This year, Killer Nashville will celebrate its 10th anniversary as an international writers’ conference with a four-day event to be held October 29-November 1 at the Nashville Omni Hotel.